Before setting out to New Mexico, Vilius Žalpys enjoyed himself at the LA Lithuanian Days. He’s pictured here with the “Martha Stewart” of Lithuania, Beata Nicholson. 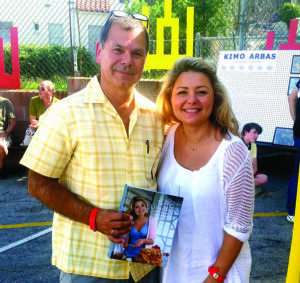 On Oct. 1, 2015, I flew out of Portland, Oregon, to visit with family and friends in Los Angeles, California, and attend the annual Lithuanian Days Festival at St. Casimir’s Parish in LA. I intended to spend the week in and around LA. As I was filling out the paperwork for my rental car, I was told that I could take the vehicle anywhere in the continental US. A thought flashed in my mind — anywhere? I could drive to Rincon, New Mexico! 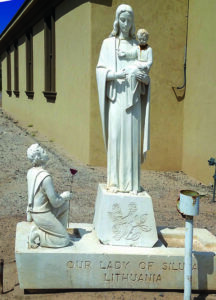 Years ago while researching Lithuanians in the US West, I learned that there was a statue of Our Lady of Šiluva in New Mexico. Reportedly it stands in front of the Mission of Our Lady of All Nations. Would it be worth driving that far just to confirm that the statue exists? What if it was no longer there? I tried to put it out of my mind and just have fun at the Lithuanian Days, but the thought kept nagging me. Google Maps showed it would take only (!) 12 hours to drive there from LA. While still at the LA Lithuanian Days festival, I visited the Draugas newspaper booth and spoke with its ad manager Audrey Kižys. As we conversed, I noticed a few laminated cards of Our Lady. She said they were of Our Lady of Šiluva, given to her by Father Tony Markus of Chicago. He had befriended me some years ago when I was studying Lithuanian 101 at the Chicago Circle Campus, back in 1979. I was impressed by his patriotism and interest in all things Lithuanian. I lost contact with him as the years passed. When Audrey offered me several of the cards, I could not help thinking that this was a sign directing me to forge on. Our Lady of All Nations Church in New Mexico. Our Lady of Šiluva stands guard on the left. I spent the night of Oct. 3 at my sister Lourdes’ house in Glendora, California, and at 8 a.m. the following morning I embarked on what was to become my road trip pilgrimage to Šiluva de Rincon. Six hours into the drive, somewhere in Arizona, I thought to myself: “Am I crazy? What am I doing?” Then I remembered my wife’s, Luana Masiulytė’s, story about her grandmother and how the Soviets had blocked the roads as she and other believers tried to get to the annual Marian devotions at Šiluva in western Lithuania. The faithful were not dissuaded. I realized I had nothing to complain about as I sat comfortably in my air-conditioned rental car not having to worry about KGB provocations or Soviet road blocks. After 11 hours of driving, I reached New Mexico. It was dark, and I was tired. I decided to spend the night in the next town. It was called Lordsburg. Another sign? 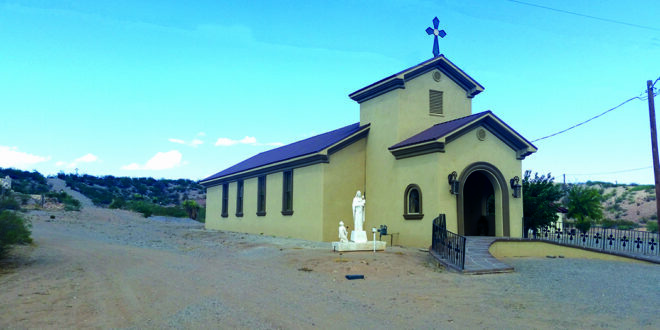 In the morning, I initially headed towards Las Cruces, New Mexico, where the offices of the Archdiocese that govern the Mission of Our Lady of All Nations are located. Reaching the outskirts of Las Cruces, I decided to turn tail and visit Rincon to make sure the statue was still there. I began the 45-minute drive to Rincon and half-way there I suddenly saw the car was running on empty. There was nothing but desert around me. I crossed my fingers, hoping to somehow make it to Rincon. I arrived there, but I learned that the town had no gas station. A local told me that the nearest gas station was seven miles away in the town of Hatch. He offered to show me the way, so I followed him, praying that I would not run out of gas before I got there. I made it. 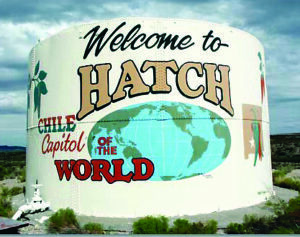 The town of Hatch is known as the Pepper Capital of the Southwest and is famous for Hatch peppers, found in many stores in the U.S. Because it was harvest season, wreaths and garlands of peppers draped the town. People were drying them on the ground and roasting them as well. 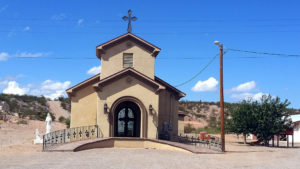 After refueling in Hatch, I searched out the town’s Catholic Church to see if anybody there could tell me about the Our Lady of All Nations Mission in Rincon. It turned out that Father Alejandro Reyes, the pastor of Our Lord of Mercy Church, was also in charge of the Mission in Rincon. Had I not almost run out of gas, I would not have come to Hatch. So I thought: could this be another sign? 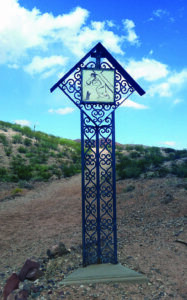 Stations of the Cross were erected by Father Justinas Klumbis in Rincon, New Mexico. The Pastor suggested that his secretary, Dora, would help me get in touch with Rosie Lack (nee Carson). Rosie told me the story of the statue of Šiluva and how a Lithuanian priest named Father “Columbus” (Klumbis) once served the local Catholics. We soon met, and she took me to her family’s Rio Valley Chili spice plant, located just over the hill from the Catholic Mission in Rincon. Rosie said her mother knew more details about “Our Lady of Lithuania,” as she and her family called the statue. I was deeply touched to hear them calling it “Our Lady of Lithuania.” It sounded endearing, coming from the locals. In the lunchroom of the Rio Valley Chili spice plant, a large family having lunch sat around four tables that were pushed together. They welcomed me into their group even though it was harvest season for the Hatch peppers, so there was much work to be done and little time to waste. 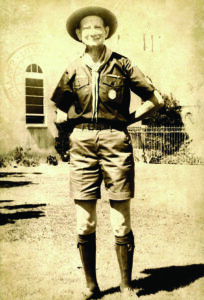 John Nick, the patriarch of the family, and his wife, Irene Carson, knew everything about the Mission and Father Klumbis. They told me that Father Justin Klumbis married them in 1958. Irene said that Father Klumbis was Lithuanian and that he created the walking path for the Stations of the Cross in the hills behind the church. On the back of each station was a mystery of the Rosary. Father Klumbis also placed three statues of Our Holy Mother on the path. The first one was Our Lady of Guadalupe, in honor of the Hispanic and Native American heritage of the area. Next was Our Lady of Fatima, the original name of the Mission, and then Our Lady of Šiluva, because of Father Klumbis’ Lithuanian heritage. A welcome sight — a water tower in the hottest place on earth. When Father Klumbis came to Rincon, he had just recently arrived in the US with his brother Romanas. They had spent a short time in a Displaced Persons’ Camp in Germany. At the time Lithuania was fighting an underground war against occupying Soviet Russian forces, which refused to leave after their so-called “liberation” from Nazi Germany. Father Klumbis left the parish of Hatch and Rincon in 1968. The cost and effort required to maintain his established Stations of the Cross were too high for the parish. As the years passed, they became overgrown with brush. The statues were vandalized perhaps because of the Mission’s isolated location. Two of the statues were moved to other parishes, while Our Lady of Šiluva was placed in front of the church for safe keeping. Our Lady of All Nations Church was once known as Our Lady of Fatima. The church itself is called a Mission and is part of the Parish of Our Lord of Mercy in Hatch, which serves its congregation’s needs. There is one Mass celebrated each Sunday. The Mission was built in 1919 from adobe bricks in the Spanish Mission style. Rena Carson (Irene Evangeline Franzoy Carson), a native of northern Italy, recently updated the front of the church with crosses from her homeland. She did an excellent job, creating a unique style. To this day, the Carsons are the Mission’s caretakers. The statue of Our Lady of Šiluva stands on the front left side of the church on brown sandy desert soil. The image is stark; there is no landscaping around the statue or the church. The statue is made of white marble and stands approximately seven feet high, including the foundation. In the past vandals broke off the Holy Mother’s fingers and the heads of the Christ Child and a kneeling boy. Mrs. Carson said that they did their best to repair them. “Our Lady of Lithuania” de Rincon stands firm despite the scars left from vandalism. Her fingers were broken off. There are several houses in the vicinity of the church, but Rincon itself is over the hill. An old railway station and railroad tracks are a short distance from the church. According to Google, the annual income of Rincon’s residents is lower than the national average; it’s a humble town. West of the Mission, not far from the Rio Grande River, are productive agricultural farms. There is a sense of peace and serenity at the Mission, particularly on the Stations of the Cross trail. It is a shock for a Lithuanian American to first encounter Our Lady of Šiluva standing on barren ground, damaged by vandals. But when you think about it, where else would Our Holy Mother be, than among those who need her the most? A semi-isolated mission with such good caretakers as the Carsons, a devoted Pastor, and congregation. I left Rincon with warm feelings for the Carsons and for the other people I met there. Twice in Lithuania’s history, Our Lady of Šiluva came to the aid of her people. Once, in 1608, as Catholics were breaking from the Church, she appeared and turned the tide. The second time was during the atheistic occupation by the Soviet Union when Our Lady served to maintain the faith of the people. I would hope that our community can come up with some support for the Mission to help repair or replace the statue. And yes, we ought to pray for those, who vandalized the statue and the religious stations along the trail. Father Justin Klumbis (Justinas Klumbys) was born in Chicago, Illinois, in 1912. He had one brother, Romanas, born in 1914, who also became a priest. Their father, the senior Justinas Klumbis, arrived from Lithuania in 1907 and married Alexandra Kasmauskis of Chicago four years later. 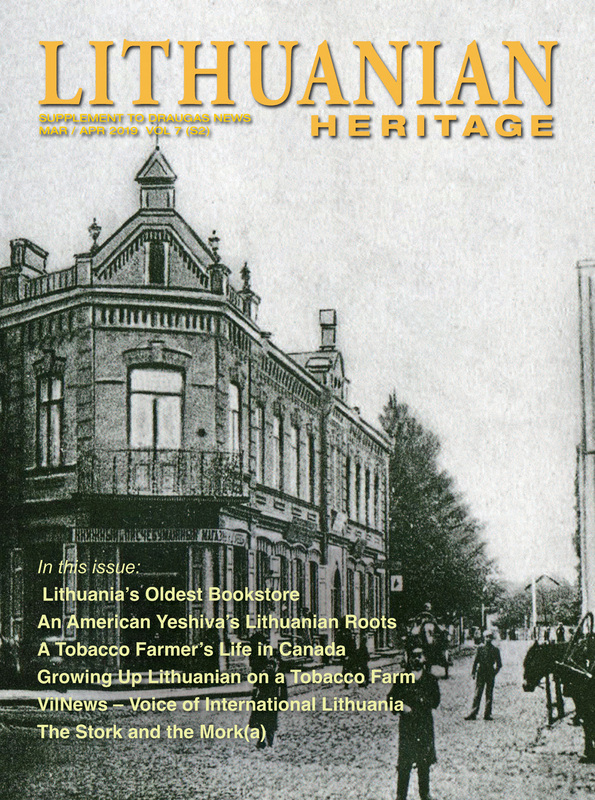 After his wife died, the family returned to Lithuania in 1921. They took up residence in the small town of Švėkšna. 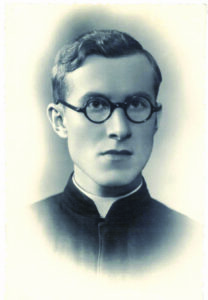 Father J. Klumbis was ordained for the Kaunas Archdiocese in Lithuania on June 3, 1939. He had studied in Italy and Kaunas, authored several books and contributed articles to numerous newspapers. According to his obituary published in the Gallup Independent, he was imprisoned by both the Nazis and the Soviet Russians. Father Klumbis eventually came back to the US as a WW II refugee. He worked for many years in the El Paso, Texas, diocese. After serving mostly Mexican American congregations, he volunteered to work among the Navajo in the Checkerboard area of New Mexico. In 1975, he ministered at the Navajo Reservation, founding the Good Shepherd Mission in Pinehaven and the St. Jerome Mission in Redrock 1976. Both churches were built in the Navajo Hogan architectural style. He also worked in parishes in Chula Vista California, and in Hurley, Deming and Gallup, New Mexico. Father J. Klumbis battled illnesses on and off during much of his life, but that did not stop him from serving the Church. He died June 16, 1977, in Albuquerque and was buried at a Navajo reservation cemetery among those he served. Romanas was born in Chicago in 1914 and also returned to Lithuania with his father in 1921 after the death of his mother. These two brothers were the real-life version of the folk song: “Du broliukai kunigai, du broliukai urėdai…” (Two brothers — priests, two brothers — stewards). His life mirrored his brother’s, as he also studied in Italy and Kaunas. He was ordained May 22, 1937. He was also imprisoned by both the Nazis and the Soviets. In June of 1941, he was shot by the Bolsheviks and was severely wounded. During the Nazi occupation, he aided Jews, who had escaped from the ghetto in the city of Šiauliai. During the second Soviet occupation, he was imprisoned in a Soviet forced labor camp but managed to escape. Both Father Romanas and Father Justinas organized and set up the Displaced Persons camp in Fulda, Germany. Father Romanas edited the newspaper Mūsų Viltis (Our Hope) in the Fulda refugee camp and also contributed to various Lithuanian newspapers and the official Vatican paper, L’Osservatore Romano. In the 1930’s he translated several books from the Italian. When the brothers arrived in the US in 1946, Father Romanas was sent to the Palm Springs Indian Reservation, where he organized and built the Indian Church in Palm Springs. Later, in Van Horne, Texas, he worked with the Mexican community and built three churches there. He served Indian and Mexican communities in the states of Texas, California, and Arizona. He sought to be assigned to the diocese of Little Rock, Arkansas to serve the Lithuanian colony there, but his request was denied. He was appointed Chaplain of the Arizona Lithuanian Mission on Feb. 24, 1989 and moved to Sun City Arizona. He passed away in October 1991 and was buried in Sun City, AZ. The two brother priests stayed close to each other for most of their lives, faithfully serving the Catholic Church and their flocks, sometimes even together in the same parish. Note: There are more details about the accomplishments of the Klumbis brothers not mentioned in this article. Each of them stood up to the Nazis and Soviets during Lithuania‘s occupations and lived to tell the story. Heros in our own time. Special thanks to Danute Gustaitė Janutienė for proofing and comments. 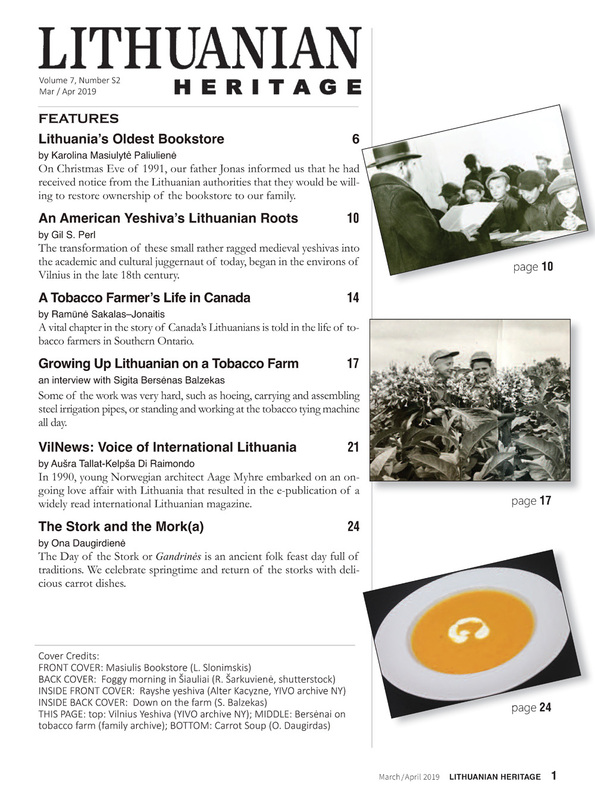 Vilius Žalpys is presently working on a book on Lithuanians in the Western United States.